Though salty foods tastes good, too much salt has a challenging effect on the body. Its presence in the body system forces the body to retain water to deal with it. 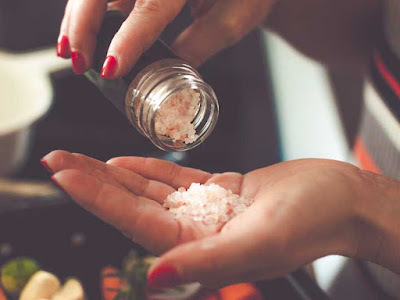 Furthermore, too much salt in your diet can raise blood pressure, swell ankles and affect the health of some of your major organs---primarily the heart, stomach and intestines. But don't fret that you can't eat just one (potato chip), here is an easy way to flush that extra salt out of your body. Drink 64 oz. of purified spring water for three days. This translates into 8 glasses that hold 8 ounces of water each. Spring water is devoid of salt---some natural waters are not. It is important to choose a water that is naturally salt-free, and while this might seem like a large amount of water, know that the body retains water even if it is a little dehydrated. This technique ensures that the body gets plenty of water and ironically responds to this hydration by releasing any excess water. And it is in the excess water weight where the body stores the salt. Eat foods that are low in salt for those three days. You want to limit your salt intake to under 1500mg a day. Read labels to find out how much sodium is present in the foods you intend to ingest. Clearly, junk foods are out of the picture as they are usually extremely high in sodium. And of course, do not add salt to anything. Use alternative salt-free spices in your cooking such as garlic, pepper and other spice combinations that are marketed as "salt substitutes." Cut down on your carbohydrate intake. Complex carbohydrates, fruits and vegetables are the only carbohydrates that you should eat during this three-day salt flush. Forget the bread and pasta. Every pound of carbs stored in your body hold 2 or 3 pounds of water and it is this water that holds the excess salt. Thus, the practice of eating high-protein foods low in carbs, such as lean meat, oatmeal and brown rice, assist the entire process of drinking great amounts of water to purify the body system of excess sodium. Sweat out the excess salt. For the three-day flush, choose to exercise aerobically while wearing warm clothes that will force you to sweat when you are moving. Alternatively, you can choose to haunt a sauna daily. Stay in the sauna long enough to break a sweat. When you are sweating profusely, leave the sauna and shower with tepid water. After you are cleansed of surface impurities as well as cooler in body temperature, do this sauna step again. Be sure to drink plenty of water.